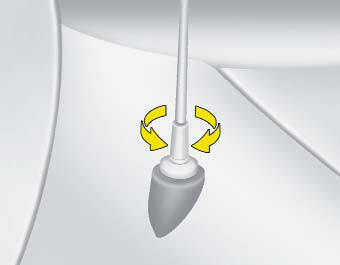 Your car uses a fixed rod antenna to receive both AM and FM broadcast signals. This antenna is a removable type. To remove the antenna, turn it counterclockwise. To install the antenna, turn it clockwise. Be sure to remove the antenna before washing the car in an automatic car wash or it may be damaged. When reinstalling your antenna, it is important that it is fully tightened to ensure proper reception.